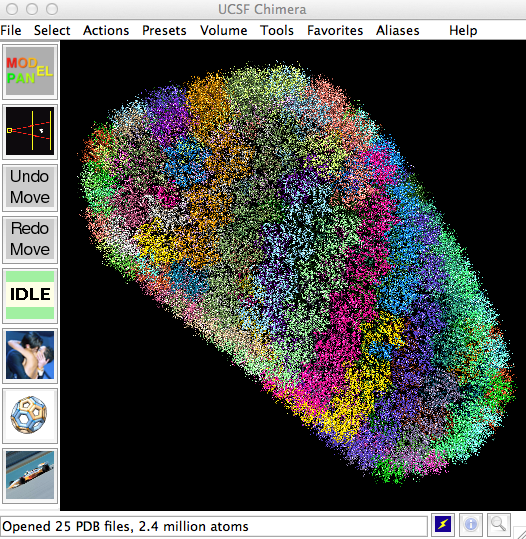 Chimera is a molecular visualization and analysis program similar to PyMol and VMD. About 10,000 users. Why use mmCIF files? Convenient for large structures, more than 62 chains, more than 100,000 atoms in one file. Why to not use mmCIF? Analysis uses many programs which all support PDB format, but only some support mmCIF format. What would encourage software developers to support mmCIF? I'll give a Chimera developer perspective. We want production quality code (fast, memory efficient, object oriented) for reading and writing mmCIF, and don't want to write it ourselves. A significant technical obstacle reading mmCIF or PDB format is figuring out which atoms are connected by bonds. Two main points: First a production quality mmcif reading and writing library will be needed to make mmcif widely used. Second, the mmcif files should explicitly list the bonds -- which pairs of atoms to connect. mmCIF reader added to Chimera 7 years ago, May 2006. Estimated PDB and CIF use: 98% PDB format, 2% CIF format. Searching Chimera bug database, 1788 tickets include ".pdb" file names and 49 tickets include ".cif" file names. Counted by searching for exact text ".cif" and ".pdb". Very few bugs are related to file format problems. Some of the ".cif" files are small molecule files not from the PDB. Chimera does not write mmCIF. Comparison of speed and memory use of 4 different file readers on molecular structures of different sizes. Chimera PDB reader is about 50 times faster than its mmCIF reader. Next generation Chimera is about 5 times faster than Chimera, but only the atom_site table, and fills arrays, not molecular objects. Protein Data Bank C++ library CIFPARSE-OBJ only produces tables, not molecule, residue and atom objects. Doesn't convert strings to numbers. Large structures are uncommon, but comparisons of many smaller structures (e.g. 190 HIV reverse transcriptase, 1.5 million atoms) are of interest to many researchers. Memory use is important too -- should not require more memory than typical laptop/desktop computer has. Tests on 2013 iMac with 32 Gbytes of memory and 3 Tbyte fusion drive. PDB Identifiers: HIV RT 4b3o, Proteasome 4c0v, 5 ribosomes 1voq,1vor,...,1vp0 (10 ids), HIV capsid 1vu4,1vu5,...,1vut (25 ids), 3j3q.cif. Chimera uses the Python Macromolecular Library (mmLib) to read mmCIF files. Written by Jay Painter in 2004 in the lab of Ethan Merritt at University of Washington. Developed for viewing TLS (translation, libration, screw), domain motions in crystallography. Provides molecule, residue and atom objects, not tables, when parsing mmCIF. mmCIF parser is 2000 lines of code, plus 500 lines we wrote to convert to Chimera objects. Much PDB parsing complexity results from variant PDB formats created by different software packages. mmCIF defines 352 table types (i.e. "Categories") and 4142 items as of version 4.034, Aug 8, 2013. Estimate one programmer year needed to develop production mmCIF read/write code. Chimera reads or writes 65 file formats handling molecules, sequences, density maps, 3d scenes, etc. Applications like Chimera need molecular objects, not relational database tables. Significant code is needed to convert tables to molecule objects. The exact definitions of atom, bond, residue, chain ... objects is not too important since each application will need to convert to their own preferred object definitions. CIFPARSE-OBJ parser from RCSB produces tables. mmLib produces molecular objects, which is why we chose to use it in Chimera. Creating molecular objects involves matching corresponding names in different mmCIF tables, such as chain, residue name, residue number and atom name. It is difficult to determine which atoms are connected by covalent bonds from mmCIF files. Using mmCIF files would be much easier if bonds are explicitly listed in the file. Currently bond patterns for every possible residue type are kept in a chemical components file, components.cif. This file is too large (150 Mbytes, 35 Mbytes compressed) to distribute with software. New templates are added every week (2 Mbytes larger file size from August to October 2013). Requiring internet connectivity to open an mmCIF file and show bonds is unreasonable. Include bond templates for 265 residue types (standard amino acids, nucleic acids, ...) with Chimera. If residue type found that is not included with Chimera, call a web service (hosted by our lab) that provides the templates. Our server updates the templates from the RCSB every week. If residue type is not in PDB complete list of residue types, or if no internet connectivity, or server is down, then connect atom pairs that are close. Atoms are close enough for a bond if closer than sum of element-dependent bond radii plus 0.4 Angstrom padding. Include about 100 templates with Chimera from Amber LEAP template files. For unknown residue types put bonds between close atoms as with mmCIF. These methods will produce the incorrect bonds when distances between atoms are far from normal. H1, H2 and H3 hydrogens are in NMR structures at the N-terminus of a protein, connected to the amide nitrogen. There are no H1 or H3 bond templates -- only H2! The Chimera mmCIF reader has special code to attach H1 and H3. Templates give the intra-residue bonds. Bonds between residues are given by chem_link_bond records. I wasn't able to find chem_link_bond records in any mmCIF files. Apparently inter-residue bonds are hard-coded for proteins and nucleic acids. Our bond template web service averages only 3 successful queries per day, with 20 failures per day. The failures are from unknown residue types, probably small-molecule CIF files. Are chemical component bond templates used by other software? Correct bonds using simple code could be achieved by explicitly including the bonds in mmCIF files. The existing mmCIF struct_conn table would list these. File size would be increased by about 30% (including only mandatory columns: chain id, residue name, residue number and atom name of joined atoms). Another option is to include the needed residue templates in each mmCIF entry. This would be harder to use. mmCIF format will only replace PDB format if most software supports it. Open source, production quality mmCIF read/write code is needed. All covalent bonds should be explicitly listed in mmCIF files.